COLUMBIA, Mo. – The enhancing Missouri’s Instructional Networked Teaching Strategies (eMINTS) National Center at the University of Missouri College of Education has been awarded a $12.3 million Investing in Innovation (i3) grant from the U.S. Department of Education to study the effectiveness of integrating teacher instruction with certain technologies while simultaneously exploring strategies to expand the program throughout the U.S. The researchers also received more than $3 million in matching gifts to complement one of the largest grants the college has ever received. The MU College of Education is the only school in the country to receive three separate i3 grants. This new eMINTS expansion project will study the effectiveness of the program on teacher instructional practices and student achievement in math, language arts and science. The project also will allow the eMINTS National Center to explore strategies for increasing the cost-effectiveness of expanding the program to more schools around the U.S., including additional schools in Missouri. 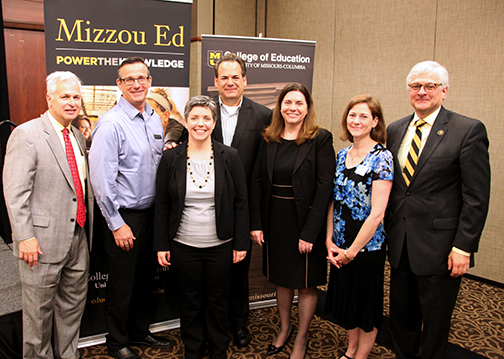 Tom Hiles, vice chancellor for advancement, Chris Watkins with SMART, Christie Terry, associate director for eMINTS, Allen Landever with KC AV, Kathryn Chval, dean of MU College of Education, Lorie Kaplan, executive director for eMINTS, Hank Foley, MU interim chancellor. The Investing in Innovation program requires all grantees to secure private sector support. eMINTS received more than $3 million dollars in matching funds through cash donations and in-kind contributions from contributors such as KC Audio-Visual, Dropbox, Inc., SMART Technologies, Swivl, Google Foundation and the International Society for Technology in Education (ISTE). Additional information about the i3 Program and the eMINTS proposal can be found here. The Investing in Innovation Fund was established as part of the American Recovery and Reinvestment Act of 2009. This is the third i3 award that the University of Missouri has received, including a 2010 i3 grant awarded to eMINTS that concluded in September 2015. That grant studied the effectiveness of the program for 60 rural Missouri middle schools. The research study found positive results in the classroom community, lesson design and technology integration, as well as improved student achievement in mathematics. The College of Education also received an i3 development grant for a project called “Mission Hydro Science” in 2014. Founded in 1999, the eMINTS National Center at the MU College of Education offers evidence-based professional development to teachers across the United States and in Australia. It plays an important role as part of the MU College of Education’s mission to support educators and administrators in PreK-12 settings. For additional information about the i3 project or eMINTS, email emints-info@missouri.edu or call (573) 884-7202.